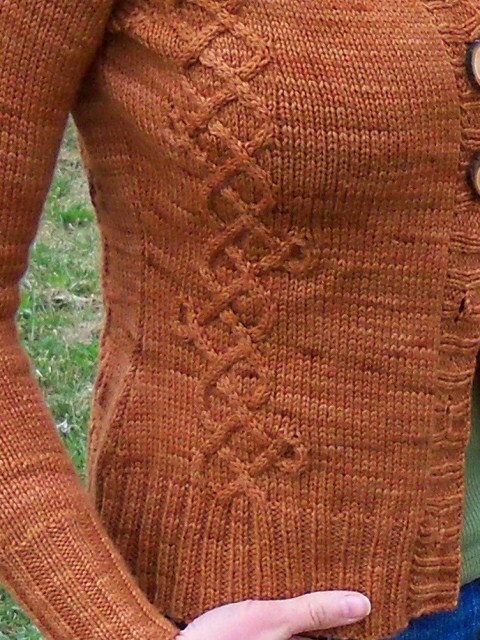 My Boyden cardi pattern is finished! You can favorite an queue it on Ravelry, and see it at home on the web here. 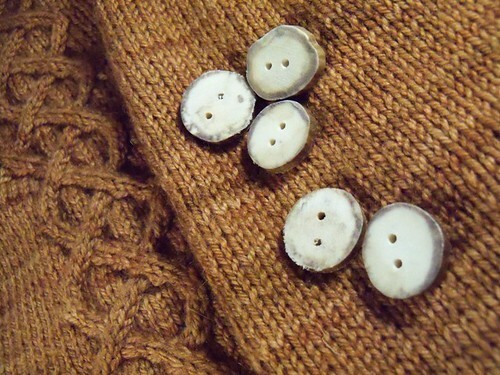 I love everything about this sweater, the yarn, cables, buttons… I hope you love it as much as I do! Like all my indie garments it is available in nine sizes to fit as many knitters as possible! 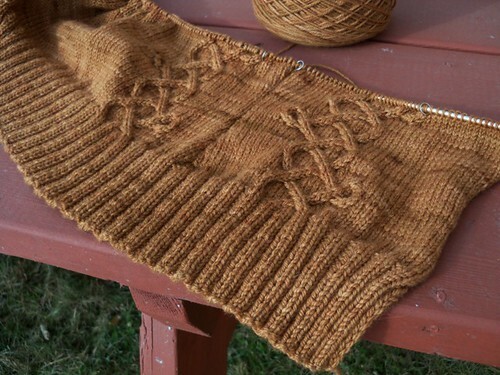 The cables are all charted, and there are setup rows for each size so that no matter which size you need the cables will grow out of the ribbing naturally. All this takes a bit of demonstrating, so there’s a whole page of cable charts. But even including that page the actual pattern is only 4 pages long. The cover page includes all your notions and materials, the final page shows the schematic, photos, and credits. So if you wanted to save paper you could print just the middle four. 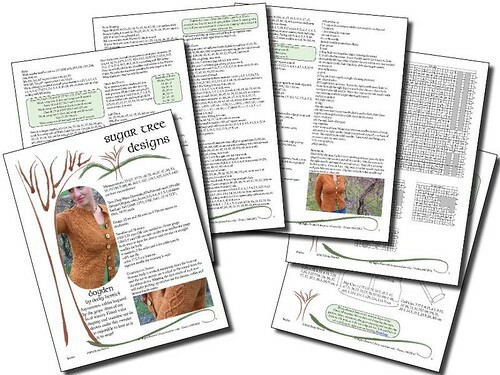 I really enjoyed discussing this sweater design process on my blog, I can’t do this for all designs (especially not the published one where the contract says not to) but I hope this journey has been insightful. Maybe it’ll inspire someone else to try their hand at designing! It’s not magic, just a lot of fun (but hard) work! 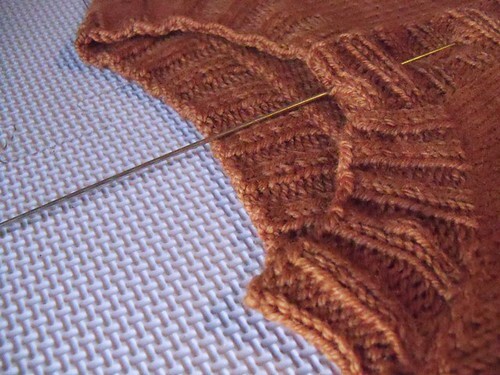 My Boyden cardi is coming right along*. Last weekend Neil and I headed down to Boyden Valley Winery for a photo shoot. Since the cables on this sweater were inspired by twisting, intertwined grape vines it seemed like a winery was the perfect spot for a photo shoot. And it was! Also, once we finished up with the picture taking we headed inside for a wine tasting and food pairing, which was a nice perk to a well chosen photo shoot location. For the second draft I go back and tackle similar things in groups. If I need to check my math in three different places it makes sense to do those all at once. Then I go through and double check all my cables. I might try to clear up the wording, but I also make notes for when I really just need to get my tech editor’s opinion on something. Neil’s been studying for mid terms all week, which means I’ve had lots of time in the evenings to work on my pattern. Yesterday I decided it was as good as I could hope and sent it off to my tech editor! 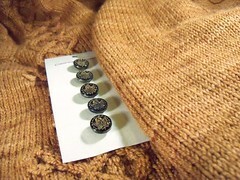 *If you want to see past entries on the boyden cardi design process check out everything with the designinprogress tag. **since this whole “designing in public” thing is pretty new and different anyway. ***I highly recommend the Edna yarn I used for this pattern. The skeins can be ordered right from Dirty Water Dyeworks, and at 380 yards to the skein they’re an amazing deal! 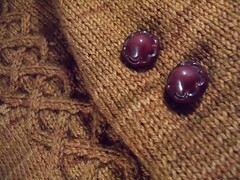 The collar and buttonbands have been my evening knitting for the last week. 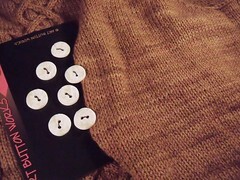 The buttons (from OruAka) arrived and are perfect for this sweater. 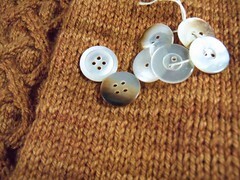 After the sweater dries and the buttons are attached the garment will be done! But soon there will be a pattern! Finishing the garment is a big step in that direction. Well, they DO line up. But they don’t look great. Again, I knew this was coming. 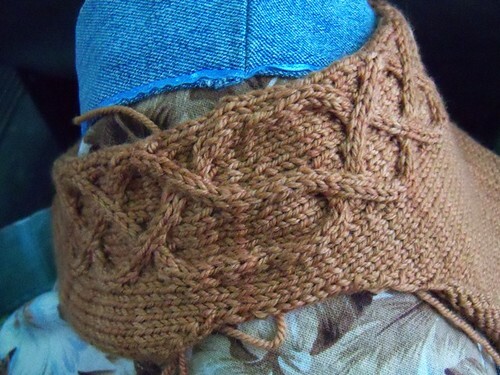 The problem is that to make the sweater fit well, there need to be some short rows across the shoulder here. * Which means that the cable strand closest to the armscye just floats for 2 rows, while the strand closest to the neckline floats for 6. So now I’m pondering what kind of twists I can get into a mere 6 rows. Clearly I need at least one cable cross, but two will make the strands flow better. I’m going to play with some graph paper. Right now I’m thinking this will actually work best if the shoulder cable starts at the neck divide, rather than continuing the standard cable up the first part. That’ll give me 8 or 9 right side rows in which to make the cables cross in a way that fits the pattern and still lines up with the front. *Look at your shoulder in the mirror. See how the part closest to your neck is higher? Your shoulder slopes down to the point where it meets your arm. It makes sense that you need more fabric to get over the high part of your shoulder than the low part. 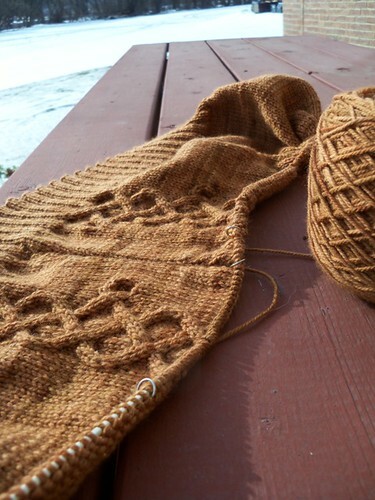 I’m up to the front halves of the Boyden cardi. Each half is worked on it’s own after the underarm divide and then the back is worked last. I knit the plain front first since it was easiest. Everything went smoothly although I did add one extra decrease to the armscye to make the front a bit more narrow by the time it got to the shoulder. One extra k2tog is nothing in a field of stockinette. But on the cabled front it’s a wee bit trickier because the cable is snug up against the shoulder shaping by the top of the work. 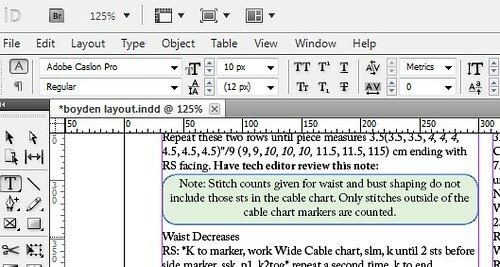 An extra decrease on the shoulder edge means I need to nudge my cable chart over by one stitch – preferably WITHOUT ripping the whole thing back again! Good news is moving the cable panel over is really pretty simple. Let me show you my neat trick. * First I will point out that my goal here is to have the correct number of stitches when I get to the top of the shoulder. I’m fudging the decrease for the sample to create the same look that the final pattern will give in a much more straightforward way. Yes in an ideal world all the decreases would happen in a neat line along the edge of the armscye. But this is not an ideal situation. Instead of working the last decrease at the armscye edge where it would start eating into the cable itself, I worked the decrease in the stockinette stitches immediately the right of the cable. And then I hid this decrease under the cable crossover that happens at that point so in the photos you won’t see a random decrease breaking up that field of stitches. 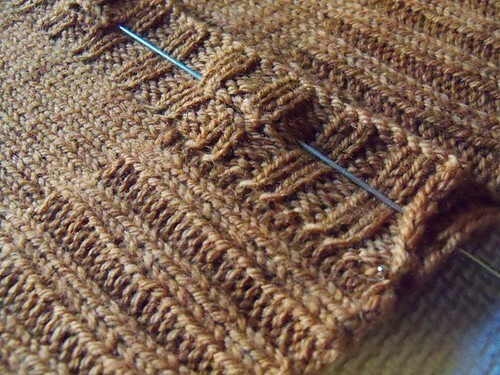 Which leaves me with the correct number of stitches between my cables in the chart! And the correct number of stitches on the armscye edge. AND the correct number in the stockinette portion of the shoulder. Everything is correct. I just used a sneaky alternative method of getting there. 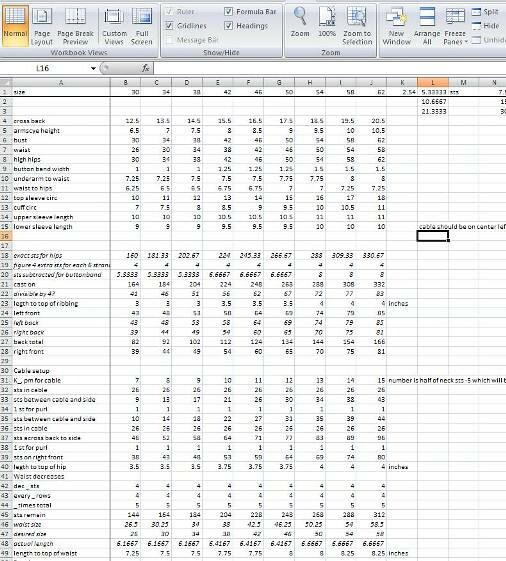 If you were inspecting the garment in hopes of reverse engineering it you might notice that there are only 5 decreases along the armscye edge where there ought to be 6. But for everyone else’s eyes this fudge is completely invisible! And completely inconsequential if you’re going to be knitting from the pattern. *please excuse the crappy cell phone photos. The lighting on the bus is not great. At least I was doing this in the morning not in the dark of the evening commute. In the mean time there is SWATCHING going on behind the scenes. There are a bunch (um, 3? 4?) publication calls right about now that I’d like to submit ideas for. On top of that I have a few indie designs in the works which I’m pretty excited about. 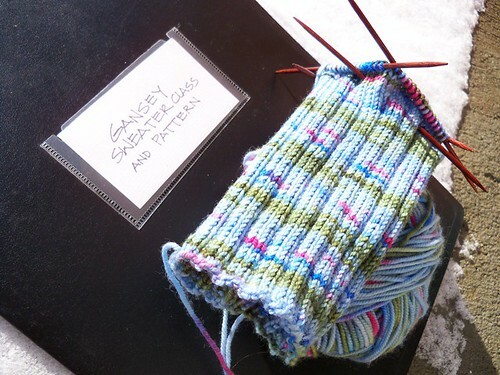 Swatching, sketching, and brushing up on some specialized skills allows me to foster the excitement for the next design while I’m in the fairly-simple-knitting stage of the current design. Yes there may be some gansey inspired goodness in my future. And to be properly inspired I should learn about the originals. Right? Right. Oh, and there’s also a sock. Actually, it’s the second sock. And given that I cast on the first sock last friday I’m feeling pretty good about this pair. It’s a dead easy K3, p1 ribbing and standard heel flap. But the yarn is oh so pretty. It’s colinette jitterbug which is a fat squooshy sock yarn so I’m using 2.5mm (US 1 1/2) needles for it and the cuff is only 60 stitches around. Between all that and the fact that I’ve finally learned I prefer my sock cuffs about 5 inches long I’m sure I know why these are knitting up so quickly! 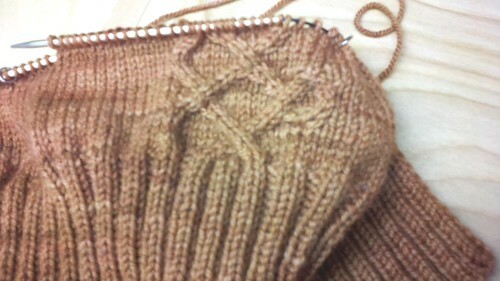 After its rocky start my cardigan is coming along nicely. Neil and I were in the car a fair bit this weekend, so I’ve knit through the waist shaping and started into the bust increases. The nice thing about writing the pattern up in advance is that once I’ve tested the details (such as, do I really want a ssk here, or would I rather a k2tog?) the knitting is smooth sailing. Other than the occasional bought of self-doubt (Is the body long enough? Did I double check the shoulder numbers? Is that really the right waist circumference?) I can follow my pattern without thinking too much, just as I might follow a published pattern*. However, it is still hard to knit cables in the dark. Granted that it’s a hand drawn chart with quite a bit of editing… But still. See how there are clearly THREE stitch boxes between the cables? 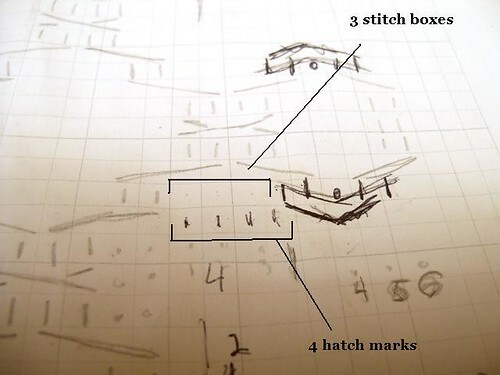 And see how I’ve carefully made FOUR hatch marks underneath to indicate four stitches? Yeah, clearly that’s the cable’s fault. Luckily I noticed after just 2 rows (204 stitches each) And I’m pretty proficient at dropping down and fixing a single mis-crossed cable with a crochet hook. But this isn’t just a mis-crossed cable. This is a misplaced 1 to 5 stitch increase. That’s a lot of extra yarn to try and smudge around without making it look gross and loopy. 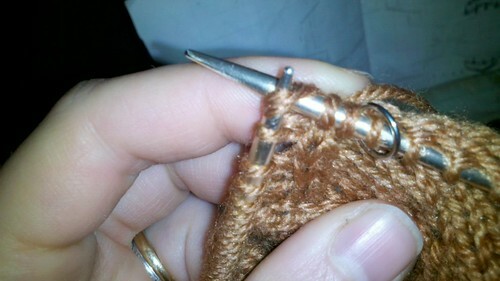 So I TINKED BACK two rows (408 stitches total) to place the increase correctly. CRAP! My bind off is going to cut into these cables! It’s not even like I misplaced the cable panel by 1 or 2 stitches. If that were the case I could do a little creative m1 and k2tog work and nudge the cable over. Correct the mistake in the final pattern and no one would ever know. Nope, I’m off by EIGHT freakin’ stitches. I had to RIP THE WHOLE THING. 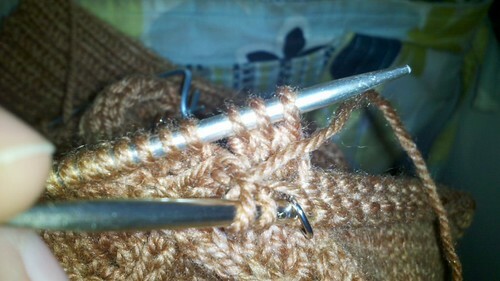 Last night I fortified with a good homebrew, and ripped over 3000 stitches so I’m back to the ribbing*. Then I realized I’d left my chart at work, gave up, and knit something else for the evening. I’ll get started with a Properly Placed cable chart tomorrow, thankyouverymuch. Anyway, it’s at exactly the same point as when we last saw it – awaiting some math. So last night I sat down to do some math. What sizes do I want to offer? What’s the increment between sizes? Is there going to be a button band? Will it fit in that panel for the smallest size? Will the armscye decreases eat into the panel? How to I prevent that? This process makes my brain feel itchy, in that I-can-practically-feel-the-synapses-growing kind of way. And this sweater was especially challenging. Because of the asymmetric cable placement I need different numbers of stitches on the left and right sides. This means taking into account how much the cables will pull in the fabric, and placing the shaping, side seams, etc… all slightly akilter. But just akilter enough that the garment will look and feel symmetrical. Asymmetrically symmetrical? Something like that. And I’m doing these checks for all 9 sizes from the outset. Nothing is worse than getting one size all written out, only to find you need to change TWELVE things to make it work for some other size. Better to tackle all the sizes at once and make all the changes as I go. **check out the designinprogress tag to see all the old entries that reference this project. ***I believe it should. 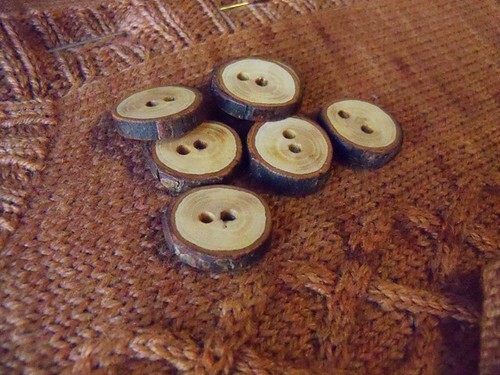 A 1″ button band is 1/30th of a cardigan on a 30″ bust but it’s only 1/60th of the cardigan on a 60″ bust. That’s half as much. To maintain the overall visual look of a design the widths of the various elements need to change as the garment sizes grow.